In the twenty years since her first short story collection, The Spectacle of the Body, Noy Holland has become a singular presence in American writing. Her second and third collections, What Begins With Bird and Swim for the Little One First, secured her reputation as a writer who excels and excites, her prose described as unsettling and acutely wrought, rhythmic and lyrically condensed. Following the recent publication of Bird, her first novel, I Was Trying to Describe What It Feels Like is a gathering of stories, the majority of which have never before been published in book form. Set on two continents and ranging in length from a single page to a novella, these stories beguile and disrupt; they remind us of the reach of our compassion and of the dazzling possibilities of language. 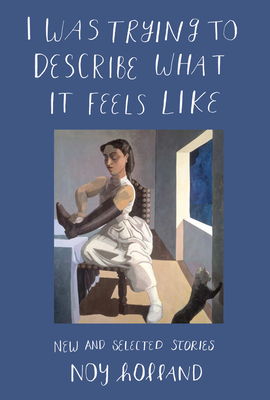 "I Was Trying to Describe What it Feels Like," from which the collection takes its title, is part love song, part fever dream--a voice demanding the ecstatic. Holland's stories do not indulge in easy emotions, and they keep to the blessedly blurred frontier between poetry and prose. Noy Holland is the author of Bird: A Novel as well as three story collections, Swim for the Little One First, What Begins with Bird, and The Spectacle of the Body. Recipient of fellowships from the NEA, the MacDowell Colony and the Massachusetts Cultural Council, she teaches writing in the graduate program at the University of Massachusetts, Amherst.